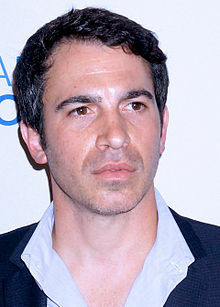 کریس مسینا (اینگیلیسجه: Chris Messina) آمریکالی فیلم یؤنئتمنی و اوْیونچو. ۱۱ آقوست ۱۹۷۴ ‏ ایلینده آمریکادا دۆنیایا گؤز آچیب. 1995–گۆنوموز ایللر آراسیندا سینما ساحه‌سینده چالیشیب. ↑ Washington D.C. Area Film Critics Association Awards list (2012). یوْخلانیلیب12 February 2013. ↑ Lortel Archives: Internet Off-Broadway Database listing for "The American Clock". ↑ The American Clock. The Commonwealth Foundation. یوْخلانیلیبFebruary 11, 2013. ↑ Sommer, Elyse. A CurtainUp Review: The American Clock. CurtainUp.com. یوْخلانیلیبFebruary 11, 2013. ↑ Daniels, Robert L. (October 25, 1997). Legit Reviews: The American Clock. Variety. ↑ McGrath, Sean. All Seasons Group at NYC's E.S.T., Aug. 9-20. The Group. Playbill. یوْخلانیلیبFebruary 11, 2013. ↑ Goldberg, Jessica. Refuge. Dramatists Play Service Inc. p. 3. ↑ Weber, Bruce. Theater Review: Those Credible Aliens, Not Quite Adult and Well Beyond Reason. The Hologram Theory. New York Times. یوْخلانیلیبFebruary 11, 2013. ↑ PHOTO CALL: Colors Come Out At Hologram Theory Opening March 27. Hologram Theory. Playbill. یوْخلانیلیبFebruary 11, 2013. ↑ Finkle, David. Review: The Hologram Theory. Theatermania.com. ↑ Bacalzo, Dan. Review: The Light Outside. Theatermania.com. ↑ The Light Outside: Ticket information. Theatermania.com. ↑ VanGelder, Lawrence (January 20, 2001). THEATER REVIEW; Got the Horse Right Here, Its Name Is Tamicanfly. New York Times. یوْخلانیلیبFebruary 14, 2013. ↑ Lortel Archives: Internet off-Broadway Database listing for "Blur". ↑ Weber, Bruce. Theater Review: Through the Eyes of the Beholder. Blur. New York Times. یوْخلانیلیبFebruary 11, 2013. ↑ Lortel Archives: Internet Off-Broadway Database listing for "Good Thing". ↑ Weber, Bruce. Theater Review: A Competition in Squalor From Adjoining Kitchens. Good Thing. New York Times. یوْخلانیلیبFebruary 11, 2013. ↑ Finkle, David. Review: Good Thing. Theatermania.com. ↑ Lortel Archives: Internet Off-Broadway Database listing for "This Thing of Darkness". ↑ Lortel Archives: Internet Off-Broadway Database listing for "Faster". ↑ Isherwood, Charles. Legit Reviews: Faster. Variety. یوْخلانیلیبFebruary 11, 2013. ↑ Lortel Archives: Internet Off Broadway Database listing for "Far Away". ↑ IBDB listing for "Salome". ↑ Who's Who in the Cast: Salome. Playbill. آرشیولنیب اصلی نۆسخه‌دن on July 30, 2013. یوْخلانیلیبFebruary 11, 2013. ↑ OffOffOff Theater Review of "St. Scarlet". OffOffOff.com. ↑ Weber, Bruce. Theater Review: Siblings at Odds, A Stranger Uninvited. St. Scarlet. New York Times. یوْخلانیلیبFebruary 11, 2013. ↑ Motel Blues: Show information. Theatermania.com. ↑ CurtainUp Review of "Motel Blues". CurtainUp.com. ↑ Isaac, Dan. Review: The Seagull. Backstage.com. ↑ Brantley, Ben. THEATER REVIEW; Conflicting Impulses Of Chekhov's Last Play. The Cherry Orchard. New York Times. ↑ Rizzo, Frank. Legit Reviews: The Cherry Orchard. Variety. یوْخلانیلیبFebruary 11, 2013. ↑ Williamstown Theatre Festival webpage. wtfestival.org. آرشیولنیب اصلی نۆسخه‌دن on June 3, 2013. ↑ Willis, John; Ben Hodges. Theatre World, Vol 61, 2004-2005. p. 231. اینگیلیسجه ویکی‌پدیاسی‌نین ایشلدنلری طرفیندن یارانمیش«Chris Messina»، مقاله‌سیندن گؤتورولوبدور. ( ۲۲ ژانویه ۲۰۱۸ تاریخینده یوْخلانیلیبدیر). قارداش پروژه‌لرده کریس مسینا گؤره داها آرتیق بیلگی‌لر تاپابیلرسینیز.